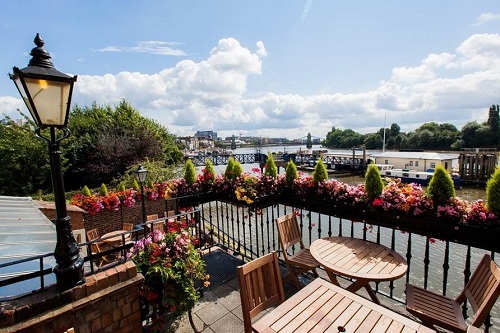 In its idyllic Thames river side setting, The Dove at Hammersmith has been a popular watering place for generations. A pub has stood on this site since the seventeenth century. It was in the pub that poet James Thomson composed the famous strains of ‘Rule Britannia’. 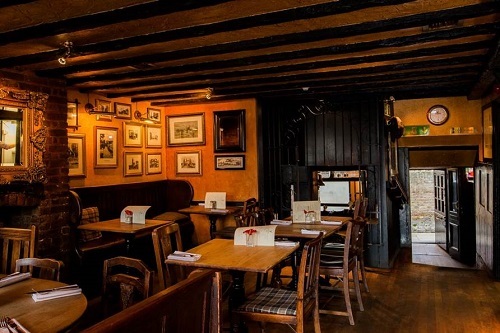 The pub was also allegedly a place of rendezvous between Charles II and his mistress Nell Gwynne. 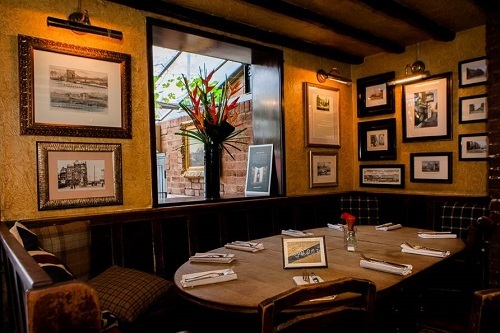 Its recent history is no less interesting being a favourite Thames pub for a large number of the finest actors, writers and politicians . The attractive building has it own claims to fame, The small space to the right of the bar, reached through an extra entrance went into the Guinness Book of World Records as the smallest bar room in the world. Step inside it and you’ll see the brass plaque that marks the height the waters reached in the great flood of 1928. 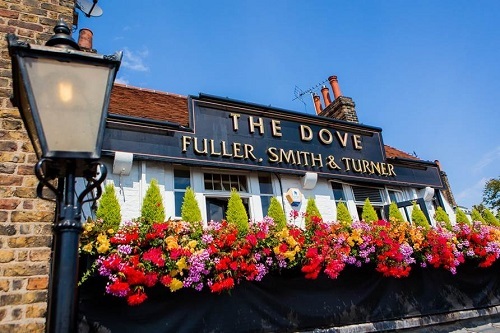 For all its history , The Dove owned by Fullers since 1796 has built a reputation for its food, catering for locals and visitors alike. The Dove and its team of chefs propose to use only the freshest ingredients, with each dish cooked to order . All of the meat is British, sourced from local country farmers, the eggs are free range and ice cream is made in Hampshire. Example of Starters Duck & pork ballotine, Cointreau cured salmon, Roasted squash & pumpkin soup, Goat’s cheese mousse,Roast quail. Example of Puddings White chocolate & raspberry roulade, Pear & fig crumble,Bengal Lancer & marmalade bread & butter pudding, Tiramisu,Selection of Jude’s ice creams & sorbets. 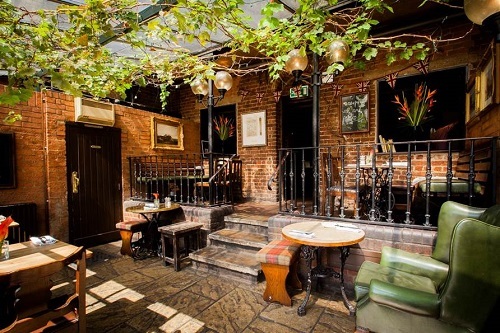 By londonvisitors2014 in London Gastropubs on January 11, 2015 .